I got the following message from Apple about my Apple TV. If you've installed the Apple TV 3.0 software update, you should immediately update to version 3.0.1. This prevents content from temporarily disappearing until it is resynced. 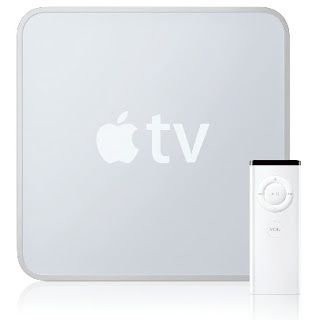 Note: Your Apple TV will conduct a restart, which is followed by the Apple logo and a status bar. Sadly, it arrived too late. The 3.0 software wiped out all of the content on my Apple TV forcing a resync of my entire library. Since I've recently upgraded the WiFi at the house, this took only several hours instead of a few days as it did when I first loaded it. The new interface on the 3.0 version of the Apple TV is really quite nice and let's you get to things a lot more quickly.